“Define Anaerobic Digestion”, said a student to me recently. No doubt because I discovered anaerobic digestion back in the 1990s via my background of environmental biochemistry originally, I quoted the original Wikipedia definition. That one is all about breaking down organic material without oxygen present (ref: 1) and is all about the chemistry involved. 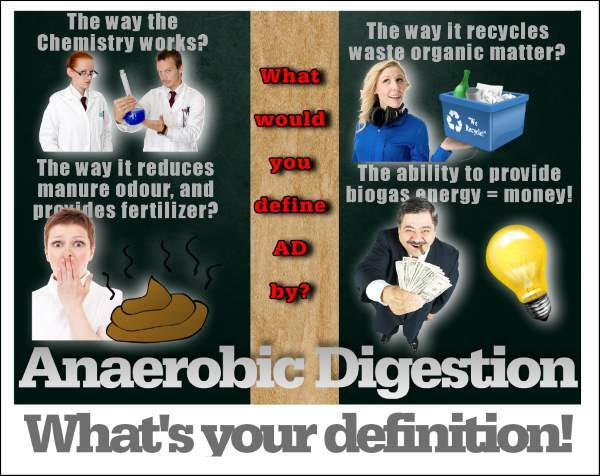 I thought There Was Only 1 Definition of Anaerobic Digestion! We Found 10! At that point, another student who had been listening, chipped in. He said, “No definition of anaerobic digestion could be right unless it centred on the ability of the AD process to “break down waste organic materials”. Wasn’t that ability, in the long term going be able to save the planet, by creating our future energy sustainably? We all agreed that its use in “decarbonising the planet” was probably more likely, what it would still be being used for in 1,000 years time. So, maybe that should be in any definition of it. Sure enough. A few minutes of clicking on the internet provided us with a definition of AD based on its ability to “break down waste organic materials” (ref: 4). It was becoming clear by this time that, the definition of anaerobic digestion was going to take many forms, and that the anaerobic digestion process meant different things to people according to their interests in the process. We continued for a few more minutes, and we had 10 different definitions for anaerobic digestion (see them all in or list below). The most commonly quoted were variations on the (old-fashioned?) chemistry based definition. Which definition of anaerobic digestion did we like best though? Our favourite, mostly for the large number of ideas encapsulated in very few words, was: “Controlled anaerobic, or oxygen-free, digestion of animal manure is a way to treat manure to prevent foul odor production while generating a usable energy product.” (ref: 8). OUR VISIONARY DEFINITION OF ANAEROBIC DIGESTION: It is the unique natural organic process which when used to recycle organic wastes can decarbonise the globe, and provide a sustainable future for the world. Which definition do you think is the best? Please do take a moment to add a comment and give us your ideas! An interesting point is made about definitions, but I’d stick with the one which is factual. “the process that creates methane and carbon dioxide” it’s outcomes that matter, not theories. Cool Dude! Would never have guessed so many anaerobic digestion definitions existed. I guess they all mean just about the same. Nice blog mate – a useful read.